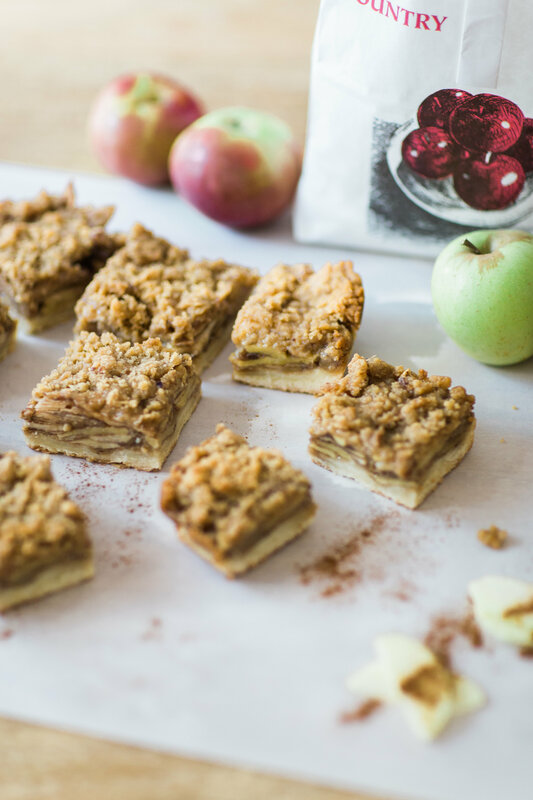 How to Make the Most Amazing Apple Crisp Shortbread Bars | Glitter, Inc. There are pretty much always apples in our house. Scarlett is obsessed, and I can’t stop picking up local apples every chance I get. We even went to an apple orchard earlier this fall. (Such a fun experience!) There’s also not a dessert in the world that I don’t like with apples. My husband basically thinks I’m the weirdest person ever for choosing any apple dessert over chocolate, cookies, or ice cream. Yep, I’m that devoted. 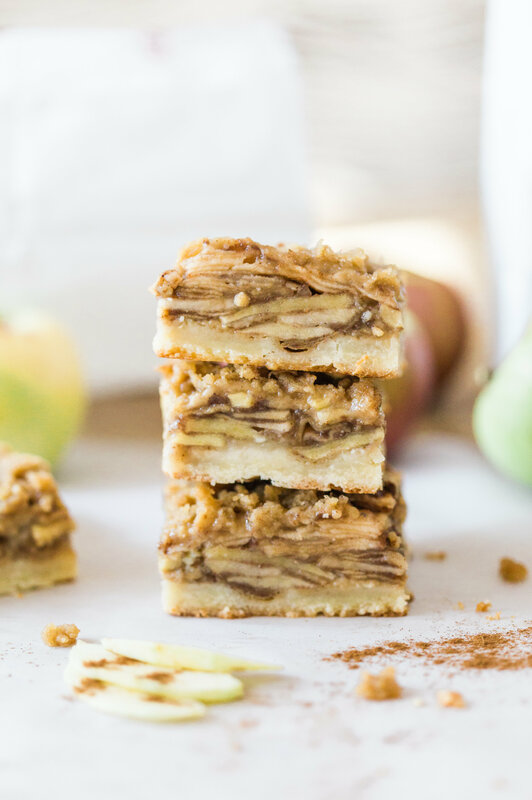 The point is, I’ve tried them all, and this is by far one of the most decadent, incredibly yummy apple desserts around. 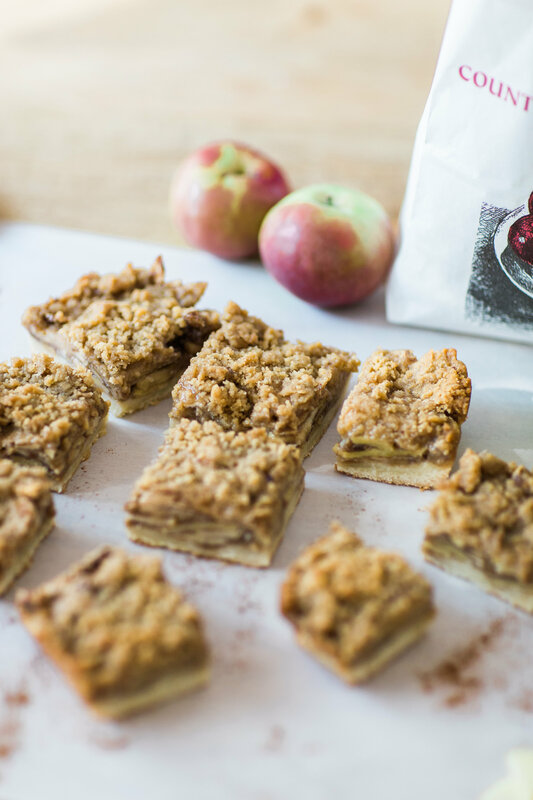 It also happens to be a great dessert for Thanksgiving or the holidays because these apple crisp shortbread bars are actually a lot simpler to make than a pie, but pack all of the same delicious flavor, and bars are portable, so they’re ideal for parties. 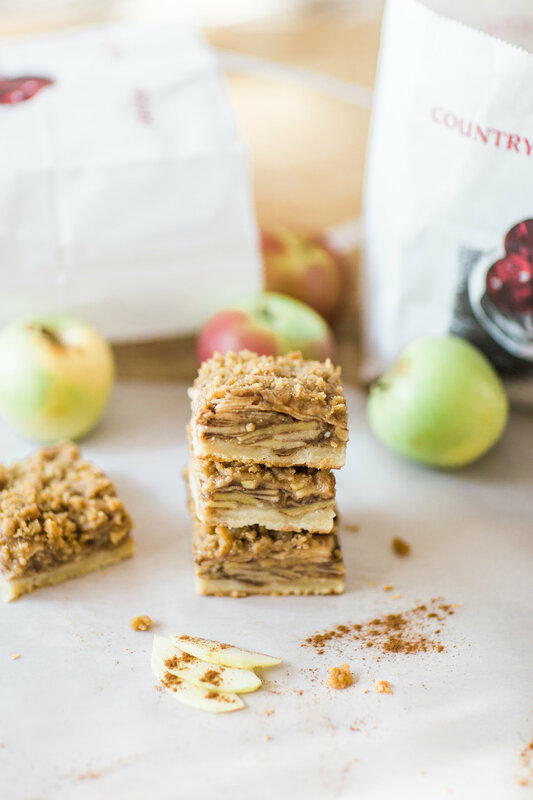 Don’t let the layers scare you; these apple crisp shortbread bars are actually surprisingly easy to throw together and the end result is something incredible: a buttery, rich shortbread cookie bottom, topped with moist caramelized apples and the most perfect toasty crisp. It’s the kind of dessert that when you take your first bite, you want to sing or cry or eat the rest of the pan. I mean, just look at them. I was amazed at how pretty the layers look. Preheat your oven to 300 degrees F and line an 8×8 baking pan with parchment paper. Be sure to use a large enough piece of parchment so that some is up and over the sides – it makes it easier to lift out later. Put the butter into your mixer and turn on high for 5 minutes or until the butter turns white rather than yellow; that’s how you’ll know it’s creamed. Next mix in the sugar, vanilla, and salt. Once combined, add in the flour and stir well. Press the mixture into the parchment lined pan and bake in the pre-heated oven for 15 minutes. In a bowl, combine the apples, flour, sugar, cinnamon and nutmeg until the apples are well coated. I did this by gently tossing with my hands. Mix flour, 3/4 up brown sugar. Cut in the softened butter and knead together. I just do this with my hands in a medium-sized bowl. Remove the crust from the oven and turn the heat up to 350 degrees F. Sprinkle one half of the topping over the shortbread, then layer the apples on top. You will have multiple layers so try to keep it level. Once this is finished, sprinkle the remainder of the topping evenly on top of your apples and place the pan in the oven to bake for 30-35 minutes. These bars taste great at room temperature or cold, just out of the refrigerator. I may or may not have popped one square into the microwave for about thirty seconds just to make it extra ooey gooey. I’m a glutton. OMG these look LEGIT amazing. i can’t wait to try this recipe! Wow, these look amazing!! I wish I could smell them thru my screen! These bars look AMAZING! Perfect recipe for this time of year. Yum! These look so amazing! 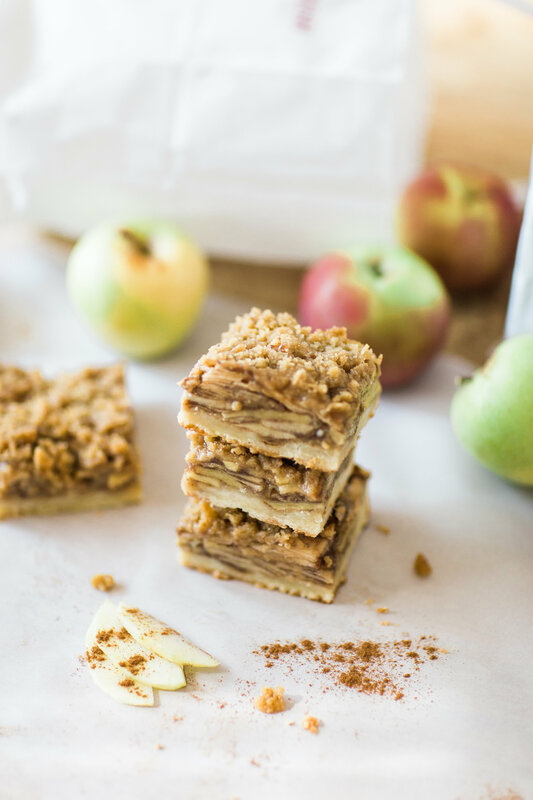 I have a ton of apples from our visit to the orchard, so I definitely need to make these! You always back the best sweets. I am a sucker for anything with apple in it! 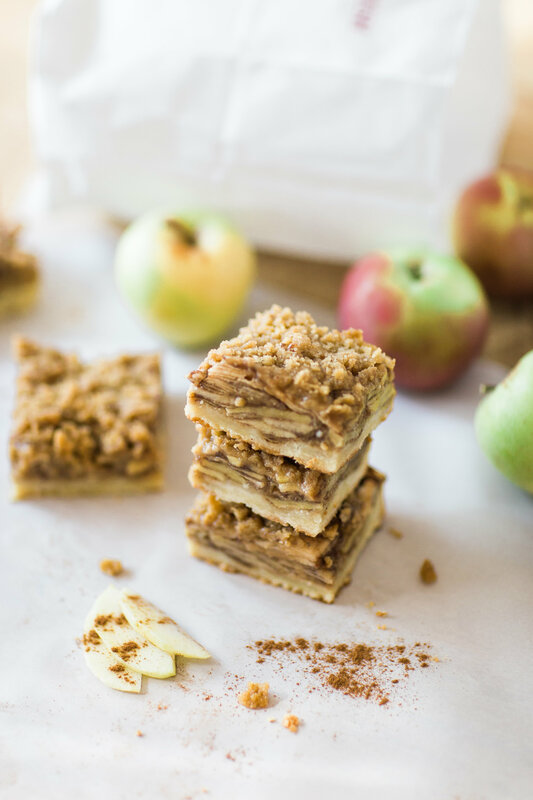 I love apple desserts and these look phenomenal! Can’t wait to try them! These look absolutely amazing! What a great fall recipe ! I cannot wait to try it and enjoyed them with my coffee! These look SO SO good!! 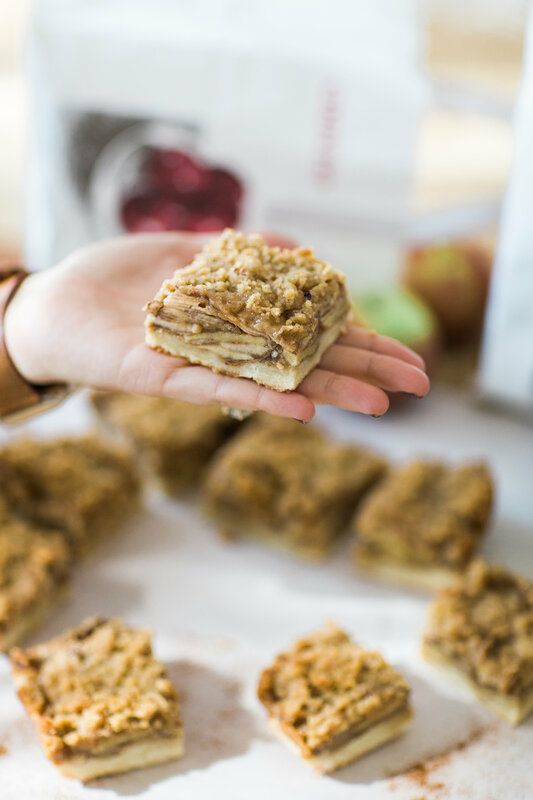 I am with you – I will pick an apple dessert over ice cream or chocolate any day! I am making these!! I need to stop reading your recipe posts because I’m trying to slim down for my wedding! These look SO good. oh my gosh those look incredible! 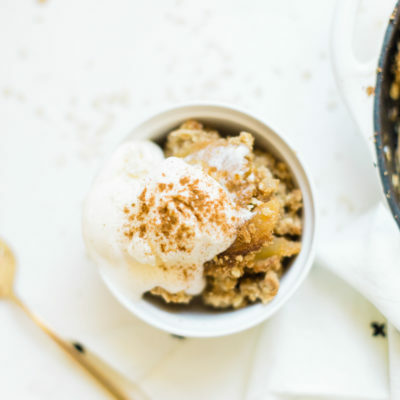 I looove apple crisp and shortbread so its a win-win! Jeez! here I am trying to be healthy and all I can think about now are these bars and ice-cream. I love apple desserts too so I’ll definitely be making them. These look amazing! I might need to make these for Thanksgiving this year! Oh my these look so yummy!!! I would love to eat the whole pan. I gotta try making these! 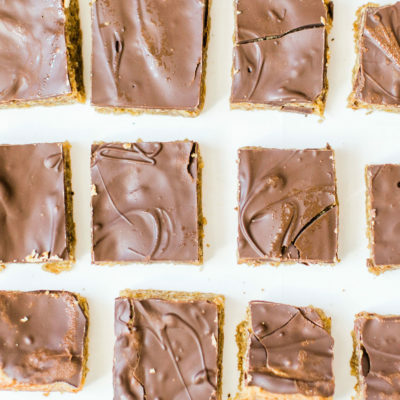 If I ever decide to step up my baking game one day… I’m making these! They look amazing! These look amazing!!! My mom used to make us apple crisp when we were little!! I will definitely be trying your recipe!! Going to the apple orchard is my favorite thing to do in the fall! 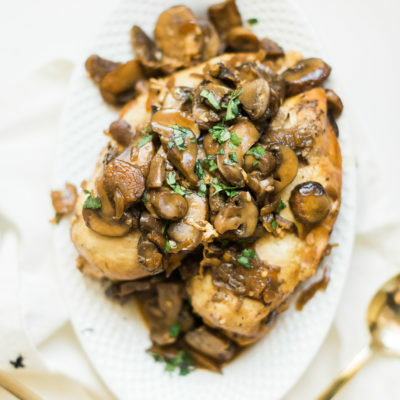 These look so yummy, and I can’t wait to try this recipe! I want this in my mouth right now haha!! When you take the crust out the first time, is it supposed to be cooked all the way through or just part way?